Integrated sportsbook, poker room and online casino. Roll the dice at BetOnline.com! BetOnline has been in business since 2001 when it opened as an online sportsbook. Since then the site has grown and it now offers online poker and a large number of casino games. This casino happily accepts customers from all over the world, including the US. In this review of BetOnline first up is a quick overview of the site. 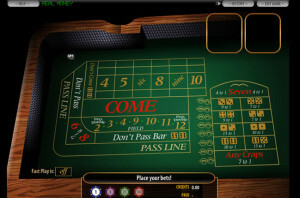 Then the two Craps games on offer are looked at including their software and betting options. After that you can find out what bonuses and other games the site offers before going into the banking options and wrapping up by checking out the customer support. BetOnline is an old and established name in online gambling. The company operates out of Panama where it is licensed and regulated. BetOnline is mainly known for its sportsbook, which offers odds on major US sporting events like NBA and NHL matches as well as horse racing. 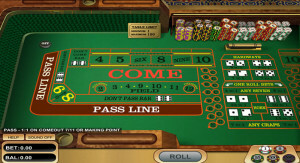 Their casino site was once operated exclusively on Real Time Gaming software, and despite a switch to DGS software, they have kept many old RTG titles. 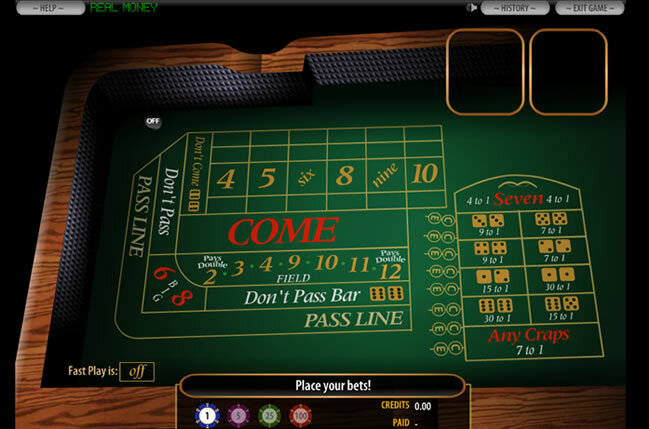 The casino runs in your computer’s browser, and is compatible with Windows, Mac and Linux operating systems. There is a download available to help you quickly launch the instant casino which I found also helped the connection. BetOnline offer two Craps games. The first is the old RTG game which has a bet and table limit of $100. While the table looks a bit flat and dated compared to the new RTG games the game is perfectly playable. You can navigate around the table very easily and all the information you need is clearly marked. You’ll find that extra information flashes up in the bottom left when you hover over a section with your mouse. After the point has been established the software allows you to bet 3x odds. Pass line odds pay out 2:1 for 4 & 10, 3:2 for 5 & 9 and 6:5 for 6 & 8. Field bets pay 1:1 with the exception of 2’s and 12’s which pay 2:1. A full list of odds and pay outs can be found under the help button on the bottom left along with some tips on playing. The second game operates on the DGS software. This definitely looks the more modern game out of the two, with more shading and depth to the graphics. The table provides a higher limit of $250 for both single bets and overall table limits. Apart from these slight differences the table offers the same odds and pay-outs as the smaller table. When you hover over the different areas the max wager and pay-outs are clearly displayed at the bottom of the page and again a complete list of information can be found under the help button. BetOnline offers a wide variety of bonuses covering casino games, poker and sports bets. These generally pay 25% for casino reloads or offer small sums of cash to play although there is a 100% slots match up to $5000 which requires a 50x play-through. Unfortunately Craps games are not eligible to unlock any of these. All players can get a benefit by getting 25% extra in free play for every qualifying deposit between $50 and $1000. This only requires a 6x play-through although once cleared it can only be used for sports-betting and not casino games. By combining the RTG and DGS platforms, BetOnline has ended up with a fantastic collection of games. Among the many state of the art 3D slots you can also find an array of table games, video poker and even scratch card games. BetOnline provides customers with some of the most used deposit and withdrawal options, although some countries, particularly the US, will not be able to access all of them. Many deposit methods contain fees and minimum limits, such as credit cards which are charged a 6% fee and require a $50 minimum deposit. US players can deposit for free with Bank Wires however this needs to be over $500. International players will probably prefer to use e-wallets such as NETeller or Skrill which have no fees and a $10 minimum. Charges and limits are also enforced on withdrawals with e-wallet withdrawals this time being charged a $20 fee and requiring a minimum of $25 to be processed. US players meanwhile have it harder with $500 minimum withdrawals for checks and Bank Wires and charges starting at $45. If you wish to contact customer support about this or anything else there is a toll free US number, an email address for casino games and 24/7 live chat which proved to be fairly quick and helpful. BetOnline is a solid choice to play online Craps. Having two different tables to choose from keeps the client fresh and allows you to go up in stakes if you are able to. Meanwhile you can get some extra value by gaining 25% on your deposit amounts to use at the sportsbook. The banking charges and limits are somewhat off-putting. These can prove costly for US players especially, as well as causing issues for those with large and small balances. Integrated sportsbook, poker room and casino. 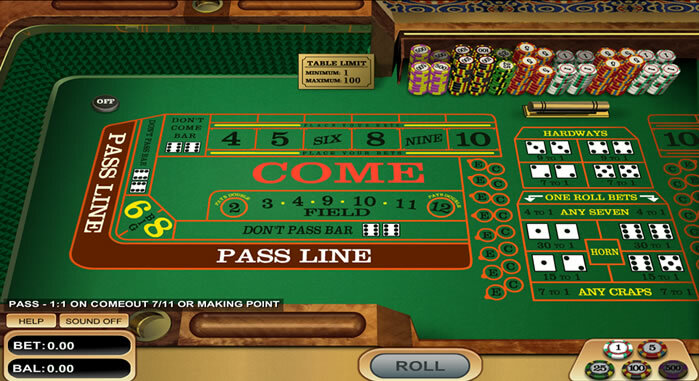 Choice of two different Craps games. Bonus is large but restricted to Slots. High banking charges and limits for US customers.